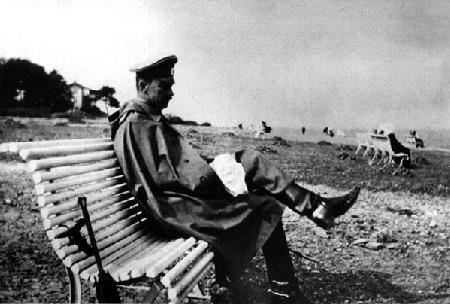 When Mannerheim was injured on a riding expedition in September 1917, he got an opportunity to consider his future on sick leave in Odessa. On the 3rd of October he was transferred into the reserve on his own request. There were complaints in the letter attached to the document that "Mannerheim did not fully comprehend the on-going democratic changes in Russia and that his attitude towards the commissars of the temporary government was erroneous". In the middle of January, 1918, Mannerheim consented to the request of P.E.Svinhufvud, the Speaker of the Independence Senate, to take over the leadership of the army, which was being established. A little earlier, on 1 January, 1918, he had sent a letter from Helsinki to the chief of the Russian main staff and asked for resignation from Russian service, on grounds of the independence of Finland, which for him marked a clear turning point in his career. The independence gave him a good reason to end his service in Russia. He wrote to the ministry. There was no need to bother Lenin or the Council of Peoples Commissars under Lenins leadership with the letter of resignation. The letter was registered in the main staff of St Petersburg on 14/27 January, one day prior to the disarmament of the Russian troops in Ostrobothnia. The letter then began its long journey through the maze of bureaucracy. The official at the head of War Ministry made a favourable decision regarding the pension, and by the end of March the Ministry of Finance had reached a decision as well. The amount of the pension was to be 3,761 rubles per year, plus the additional 859 rubles per year from the retirement fund of the pensioners, who had served a full term. Mannerheims years in service in Russia amounted to 30. Mannerheim, who had reached the age of 50 in the summer, had been transferred from his post of the Commander of the Cavalry Army Corps to the personnel reserve of the Odessa military district on 20 September  3 October, 1917, "as unadaptable to the existing conditions" (Mannerheims own words). Therefore the staff of the Odessa military district were the first to be informed of the pension decision (on 28 March, 1918, while the battle of Tampere was in full force). The pension was payable from the military funds of the city of Herson. In the document Mannerheim was titled ex-Lieutenant General, because the new regime had abolished all military ranks. It is not at all certain whether Mannerheim ever personally received the document under the chaotic circumstances of the time.